PALs, the ‘PLAY at LUNCH TIME’ support program began this week. 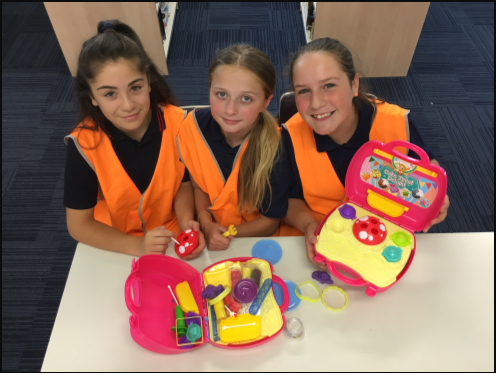 PALs is designed to assist students in Junior Primary to engage with a range of different play activities with the support of a student leader from Years 5, 6 or 7. Sharon McAskill and Jane Moore our Librarian are coordinating the program and ensuring that PAL Leaders clearly understand their roles and responsibilities and are rostered to run a lunch session each day. PALs ACTIVE BODIES - focuses on oval and gym based physical activities that are run on Tuesdays. PALs ACTIVE MINDS - provides students with daily library based activities with a focus on games, crafts, construction, puzzles and iPad use. In the accompanying photo Jessica, Sophia and Skye are preparing a ‘cupcake making activity’ for students to engage in at lunchtime. PAL leaders wear brightly coloured vests to identify themselves. The PALs program provides leadership opportunities to older students while also helping to reduce bullying amongst younger children as they learn how to play games and undertake lunch time activities in a cooperative manner. How to play successfully is a skill, and interpersonal conflicts are reduced when students are explicitly taught to play games following clear rules. Often in the early years students lack the social development to negotiate joining play groups and so engaging in games with the support of an older child is a great way to enhance their skills. A positive school ethos and social cohesion as it builds students confidence and self-esteem.